Aqua-Trace ® AQF100 is designed to rapidly assess total biomass levels in a fluid sample by detecting the presence of microbial contamination with the ease of “dip, click and read” technology. Microbial contamination are those ATP (Adenosine TriPhosphate) cells that are dead. 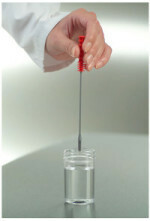 The test is ideal for measuring the residual contamination in Clean in Place (CIP) rinse water. 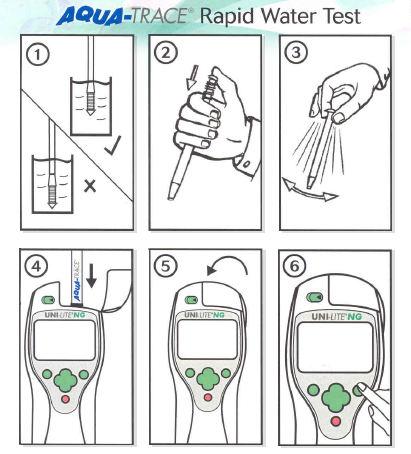 Simple and easy to use, the test can be performed with relatively little training and results are known in a matter of seconds or minutes. Description For use with fluid samples... AQF100 measures the dead ATP cells in the assay sample. The results are determined by our luminometer in RLU's or Relative Light Units. The higher the RLU value, the higher the free ATP. In using AQF100 with our AQT200 product one can determine how much of the biomass is alive and how much is dead.